Masala is a 41’6” (12.65m) Radford 415 steel cruising yacht designed by renowned Australian yacht designer Graham Radford. Graham completed his three year yacht design apprenticeship with the famous Joe Adams in 1977. Together for the next decade he and Joe designed a range of outstanding cruising and racing sailboats. In 1987 Graham started his own yacht design business. You can find out more about Graham’s illustrious career here (Masala features on this page too, search for “415”). The Radford 415 is a development of the proven 1995 Radford 400 design. Masala was professionally constructed by C-Stainless Boat Builders, from a plasma cut kit supplied by Graham, in a boatyard at Tyabb in Victoria, close to Western Port Bay. She was launched at Western Port Marina in April 2002, the first 415 to hit the water. A number of others are currently being built around the country and around the world. 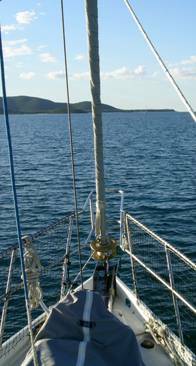 Many steel sailing boat designs are overly heavy and have questionable sailing performance, especially to windward. Not so Graham’s designs—they are all true sailing boats. Masala is a happy blend of the strength of steel with the speed of a Radford design, equally suitable for coastal cruising or a circumnavigation of the world. Stability-wise she is rated for “unrestricted offshore use”. So what does the name Masala actually mean? Masala is the Hindi word for spices. It is used throughout India for a spice blend, with myriad variations. It can be a simple combination of two or three spices or a complex blend of ten or more. There are no hard and fast rules. Most people have heard of “garam masala” which is a particular blend of nine spices. Another interpretation of the word is “a little bit of this, a little bit of that, whatever you fancy”. It is this interpretation which gave Masala her name. When purchasing the boat we were unsure about the name, but on our first cruise north from Brisbane to the Whitsundays we had some lovely days where we did a little bit of fishing, a little bit of snorkeling, a little bit of walking, and a little bit of relaxing. “Ah!” we thought, “That was a great Masala day.” And so the name stuck.